Meeting at the Masonic Hall, King Square, Bridgwater, TA6 3DH at 18.30 0n the first Wednesday, February, March (Installation), October and November. The Lodge has 39 subscribing members. At the first meeting since his Installation as Master of the Lodge in March this year, W.Bro David Smith and his team of officers performed a wonderful advancement ceremony welcoming Bro Rod Mudge into the Lodge. All the officers had taken time to learn there parts and the result was a ceremony which must have impressed the candidate. Things did go slightly awry when the Junior Warden, David Gibbs and Senior Deacon James Brown wrestled with the axe when the candidate was challenged by the Senior Warden Mike Holman. This resulted in Mike being showered with candle wax as a reward for his diligence! The Master also welcomed a new joining member into the Lodge, W.Bro Gary Boon who has moved from the Chanel Islands to Somerset. It was a wonderful Mark evening followed by the usual very friendly chat over the festive board. In the photo left to right are, David Gibbs - Senior Warden, Master - David Smith, Advancee - Rod Mudge and Senior Warden - Mike Holman. There were over 60 Mark Master Masons present at Bridgwater MH for the annual Installation of Quantock Mark Lodge. After a very successful year in the Chair when he represented his Lodge throughout the Province, evinced by the number of brethren present, W.Bro David Attwater made an excellent job of installing his successor Trevor Thomas. The Deputy PGM Ray Guthrie, congratulated and thanked David for all his hard work during his year in the Chair. W.Bro Tony Chapman continues his excellent work as secretary of the Lodge for his 23rd year! He is currently the second longest serving secretary on the Province. Pictured right to left on Installation evening, Senior Warden - Stuart Morgan (lets hope his apron lasts the twelve months!) new Master Trevor Thomas and Junior Warden - Robin Back. W.Bro Brian Eastland Installs his successor David Atwater. W.Bro Tony Wilcox the Provincial Senior Warden represented the Provincial Grand Master. The PGM David Nelson with new Master Brain Eastland and Installing Master Mike Needs. Charity Steward David Smith presents a cheque to the PGM for £749 for his appeal. 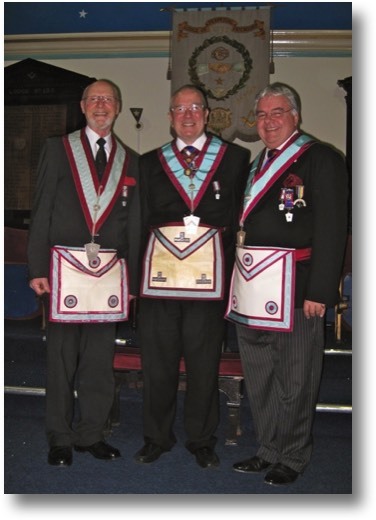 The ever increasing popularity of the Mark Degree was very much in evidence at Quantock Lodge, 749’s March meeting. When over 60 brethren, including our Provincial Grand Master, David Nelson, packed the Lodge Room for the Installation of Master Elect Brian Eastland happily Installed by outgoing Master Mike Needs after his very successful year in the chair. The Ceremony continued smoothly accompanied by the music of Matt Westley on the organ. During the meeting, David Smith, Lodge Charity Steward, presented RW Bro. David with a cheque for £749 towards the PGM’s charity, Hearing Dogs for the Deaf, an ingenious match to the Lodge number! The happy atmosphere continued into the Festive Board, the peak of which was John Griffin’s toast to the visitors presented in rhyme. John even managed to bring the name of the responder into the ending, much to the surprise of Steve Defries! the quality of each guest here, who carries the token penny. sharing with you our Ceremony, friendship and food; you’ve had it! and all too soon we will depart, each brother to his home. this perfect fraternal structure, each individual’s joy. and who better to respond to this? Than Worshipful Brother Steve Defries! Brothers of Quantock Lodge please stand, and raise your glasses high. A health to every visitor, before we say goodbye”! A happy ending to a very pleasant evening - Pat Morrisey. Somerset Young Carers get boost from Quantock Lodge.